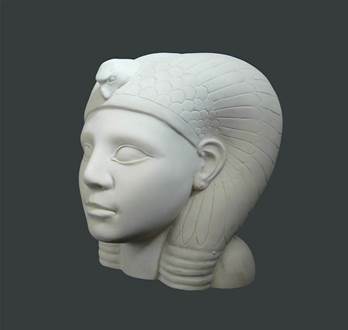 This is a copy of an Egyptian Head sculpture. The original can be seen at the Burrell Collection in Glasgow, Scotland. The provenance of the original piece is unknown. Sir William Burrell (1861-1958) was a wealthy Glasgow ship owner and he and his wife, Constance, Lady Burrell gifted his collection of over 9,000 works of art to Glasgow in 1944. His collection of art and artefacts was built up over many years, and this Egyptian sculpture like many of his acquisitions was bought from a dealer on the antiquities market and has no provenance history. So although we have no provenance the piece itself gives some clues as to what it is. The original is black in colour, probably made of black Basalt. The subject is wearing a Vulture Cap, which tends to suggest that she was a Queen. The cap associated the wearer with the goddess Nekhbet and later Mut, and emphasised the maternal role of the Queen. Hand made and finished in British gypsum plaster.